8 chairs 19 inch W x 19 inch D x 35 inch H. Seat Dimensions: 16 W x 17 D x 17 H., 1 extendable rectangular table 79 L x 42 W x 29 H. Extendable length 118. Turner 9-Piece Eucalyptus Extendable Rectangular Patio Dining Set The Amazonia Collection is committed to providing premium quality sets with an elegant design that will make your home stand out above the rest. Crafted from solid Eucalyptus Grandis wood, grown in 100% managed forests in Brazil and certified by the FSC (Forest Stewardship Council), this eucalyptus furniture is known for its longevity and craftsmanship at an affordable price. Enjoy your patio in style with these great sets from our Amazonia Collection. 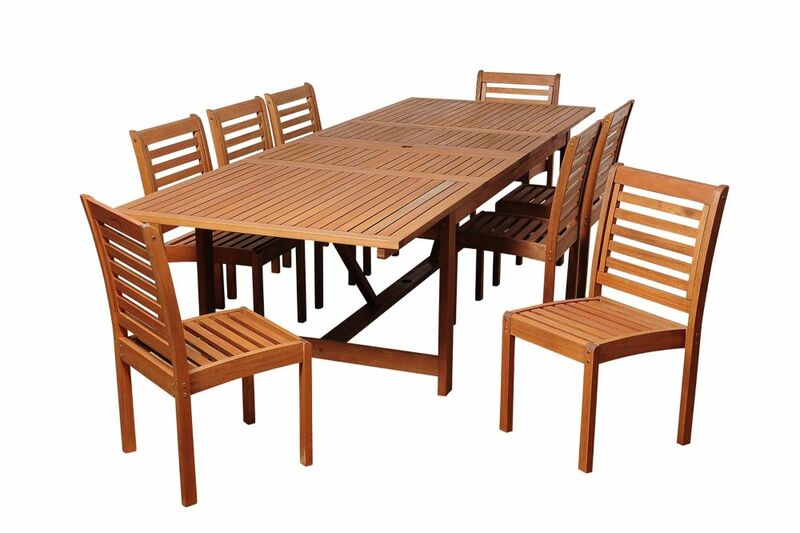 Turner 9-Piece Eucalyptus Extendable Rectangular Patio Dining Set is rated 3.8 out of 5 by 4. Rated 5 out of 5 by JS from Good table & chair set for price Very happy with it. Fairly easy to put together. Did it by myself. Only needed help to turn table upright. Extension leaves are stored in middle, just slide apart & add both or just one. Previous review is accurate saying top Is rough/not smooth. But it’s not a deal breaker. Looks much more expensive than it was. Overall very happy with it. Rated 3 out of 5 by Lili from There is a piece that is broken, I will have... There is a piece that is broken, I will have to request another one. Rated 5 out of 5 by CLBM from Turner 9 piece Extendable Rectangular Patio Dining Set Easy assembly, beautiful and looks like it was more expensive than it was.